Nothing shows how bizarre and antiquated our interprovincial trade relations are in this country than the letter I have reproduced here. Every winery in BC got one of these. Basically the Alberta government is saying, don't try and evade paying us our share of the taxes. 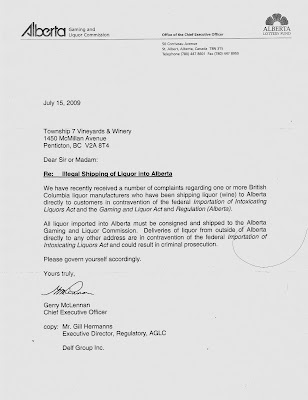 Stop shipping wine into Alberta because the dollars we're owed for every drop of alcohol is being evaded. Never mind that BC is already getting 100% of their tax on the sale. Alberta wants their share too! Consider for a moment the tiny amount of lost revenue this is. A ridiculous display of governmental malfeasance. Legally, no, but morally and de facto - yes. I believe clicking on the letter makes it bigger to read.